Sunday was a tough day for Galway supporters who were fortunate enough to get a ticket to the 2018 All Ireland Senior Hurling Championship final in Croke Park. Before the game at nearby haunts, such as Gills and the Croke Park Hotel, very few fans of both teams were adamant which team would win this year's All-Ireland final, but most Galwegians believed if their team produced a good performance, then the maroon men would prevail. Unfortunately, most of the more efficient, more intense and powerful displays inside the white lines came from men wearing green with a good few Galway players not hitting the form they would have wanted, hoped, or needed. To Limerick manager Liam Kiely's credit, his team were worthy 3-16 to 2-18 winners, and the Treaty men finally got their hands on the Liam MacCarthy Cup for the first time in 45 years. Team captain and centre-back Declan Hannon became the first man from the county to raise the famous trophy since 1973 to euphoric scenes at Croke Park and down at the Gaelic Grounds in Limerick where thousands watched on big screens. Nobody with a sporting bone in their body would begrudge Limerick their victory, and best of luck to them. They are a young team and look like a side that will be around for some time. However, all Galway supporters will be disappointed how this final panned out, particularly the concession of a trio of goals. Those three goals left Galway on the back foot, and they all could have been avoided. A huge factor in the game was that all three Limerick goals came from mistakes. Two by Galway defenders, and one by the referee. The first Limerick goal, crucially, came from a poor refereeing decision. Galway had started slowly and yet they still led by 0-6 to 0-5 after 16 minutes when Pádraig Mannion was clearly shouldered in the back by Limerick full-forward Séamus Flanagan in the lead up to the first goal. It was a blatant foul which was clear to see from the upper Hogan Stand, and how Wexford's James Owens did not award a free out to Mannion is beyond comprehension. Admittedly Galway still had opportunities to stop Graeme Mulcahy getting the ball over the line, but the sliotar should have been 80 yards down the other end of the field. Limerick's second goal was superbly dispatched by Tom Morrissey following a mistake by Gearóid McInerney, who was pick-pocketed as he tried to come out with the ball on 54 minutes. The Oranmore man struggled last Sunday, and the training he missed following his calf injury against Clare left him under pressure to get to the pace of the game with Kyle Hayes doing damage on the Galway rearguard. Galway were also architects of their own misfortune for Shane Dowling's goal when Adrian Tuohy lost possession to Peter Casey following a short puck-out. These things happen in games. Such is sport. But conceding three goals left Galway with a mountain to climb. Yet, they almost squeezed a draw at the death. After 68 minutes Limerick led by eight points, 3-15 to 0-16, and it is to Galway's credit they rallied with goals from Conor Whelan and a fabulous strike by Joe Canning from a free. A Niall Burke point brought the game to one, giving Limerick a real fright. However, Graeme Mulcahy notched a crucial score for Limerick seconds later to make it two again, and even with the incomparable Canning converting a ’65, Galway had left their 'run for the posts' too late, and it was asking too much for the Portumna man to level the game from his last long-range and difficult free. Limerick were hungrier throughout the contest. Their tackling and work-rate was immense, and they harried every Galway man in possession. The fact that Joseph Cooney was the only Galway forward to have scored from play in the first half is telling. Galway's attack did not really function, with Cathal Mannion, Conor Cooney, Johnny Glynn and Conor Whelan not having the impact they would have hoped. 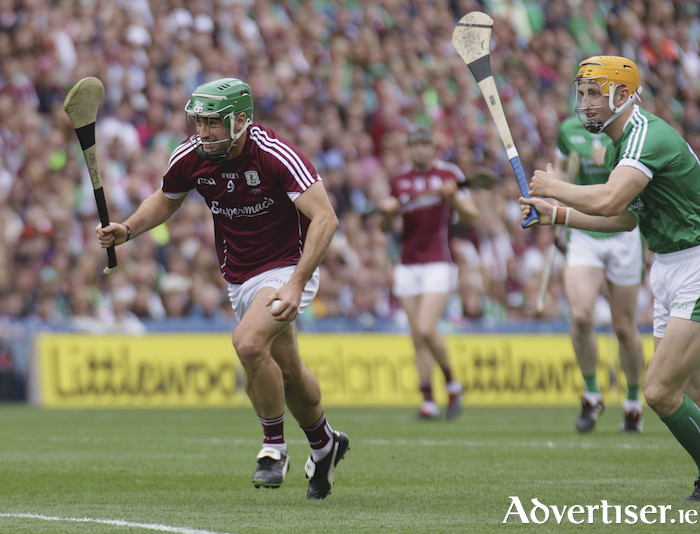 With only a single score from all four, Galway were going to be under pressure. Limerick were worthy winners. They looked the fresher team, and tactically they got an awful lot right, such as spraying balls into the corners and not launching balls down on Daithí Burke or McInerney. They kept the Galway defence on the move constantly and deserved to lead by 1-10 to 0-9 at the break. Ten minutes after the restart they had pushed that out to 1-15 to 0-10, and only for the wonderful leadership of Canning and David Burke who drove Galway on, things could have been a lot worse for Mícheál Donoghue's men, especially when they went nine down at 3-15 to 0-16 on 68 minutes. Their fight-back is what should be remembered, and Mícheál Donoghue was proud of his players' efforts after what has been an amazing and exhausting championship of hurling by his squad. "I can be no more prouder of the lads," he said. "They fought until the end. We were a puck of the ball from getting a draw, they died with their boots on, and I couldn't have asked for any more." Limerick: Nickie Quaid, Sean Finn, Mike Casey, Richie English, Diarmaid Byrnes (0-1 ), Declan Hannon (Cpt ) (0-2 ), Dan Morrissey, Darragh O’Donovan (0-1 ), Cian Lynch (0-1 ), Tom Morrissey (1-1 ), Kyle Hayes (0-4 ), Gearóid Hegarty, Aaron Gillane 0-3 (0-2f ), Séamus Flanagan (0-1 ), Graeme Mulcahy (1-2 ).